As I said in the video, in all of my years, I have never been able to get myself to conform to the way society tells me I am supposed to be. As a child that meant I was often seen as weird or different. Unlike most of the people, I didn’t follow the crowd. For some reason, my immunity to peer pressure was pretty extreme. I was willing to wait out a beat down from neighborhood kids if that is what it took to do what I felt like doing. I won’t get into the stories. All I will say is that for a significant portion of my childhood, I refused to dim my light no matter the consequence. It wasn’t until I got older that I realized that the people in my neighborhoods were trying to teach me how to be in our culture. My “difference” was throwing off the accepted norm and they were just making the necessary corrections and trying to get me in alignment. Since realizing that, I have been able to accept certain behaviors of people as enculturation and so I don’t get take it personally when they don’t get where I am coming from. But at the same time, I still don’t feel like I have to accept their points of view as my own. Instead I try to work with it as harmoniously as possible and cultivate relationships with people who can accept that “the way it is” doesn’t always work for me. Everybody needs a weird friend and I don’t mind being that guy. Sometimes I secretly cheer for my daughter in my heart when she resists some of the stuff people try to tell her about how she is supposed to be in the world. And I am including myself in that. I imagine future conversations where I confess to her that when I made her clean her room and go to bed that I actually could see from her point of view about why she didn’t feel like doing it and that she should just be able to go to bed when she is tired. I agree that she shouldn’t have to go to school if she doesn’t feel like it. When she goes up to perfect strangers and starts telling them stories and I tell her to give the people their space, I want to tell her that I really think that she is wiser than us all and that everyone should be as open. I want to say that I think it’s awesome that she still thinks she can make a dress out of a spool of thread and a ribbon and I hope that she always believes in the impossible. And I wish that everyone would always see her scribbles as works of art. Even though I don’t say it, I am so proud when she let’s her hair fly around wild and nappy and says, “It doesn’t matter!” when we try to comb it. My favorite outfits are when she wears fluorescent socks with brown, polka dots and stripes and a tiara in public and feels as beautiful as she is. The point is that I never want to be the person that contributes to her dimming her light so that she can conform to parts of this society because for the most part, I am still just like her. I don’t get why so many people think that we all have to see the world the same way. When I look at the world all I see are miracles and wonder. It doesn’t take much for me to feel appreciative. The only thing that really gets to me is when people waste their energy trying to convince me that what makes them happy is supposed to make me happy too. (Not that anything makes me happy. I’m more of a joy person.) It is so weird. I thought that by the time I became an adult, people would stop trying to figure each other out and just accept each other more. As I wrote on my other blog called, How’d I Get So Rich?, I see abundance and beauty everywhere–like the sun reflecting in that mud puddle. Can you see how beautiful it is? Can you hear it’s gospel? Does the sun see itself as too good to shine on a mud puddle? 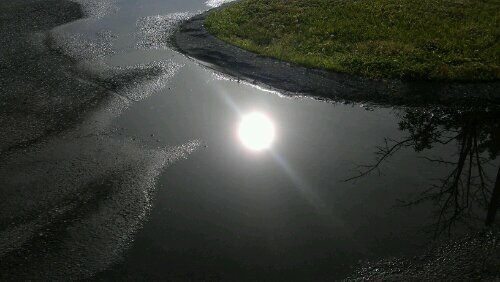 Does the puddle see itself as unworthy of the light? Of course not. In my world, all things are of the light. As long as I’ve been here, I still don’t get why so many of us live life as if it were a competition and that what one receives takes away from another. It seems that if everyone didn’t accept the programming that we are supposed to desire the same things, our natural diversity would create different desires for everyone and we’d all have exactly what we need. I see the confusion coming from the false belief that we are all supposed to have whatever is popular and so we compete with each other to get ours. Maybe not. I just love my mud puddle and feel as blessed as if I were on an island in the Caribbean. That’s how I choose to see the world. To some that makes me look like I lack ambition or direction because essentially I don’t really have material goals as markers of success. I just enjoy discovering beauty wherever it can be found–which I believe is everywhere if we choose to see it. But if you choose to see ugly, feel free. There’s even something awesome about us being able to use our creativity that way. All I ask is that if you see me staring into a mud puddle with a smile on my face holding the hand of a princess dressed in polka dots and stripes, just let us be.